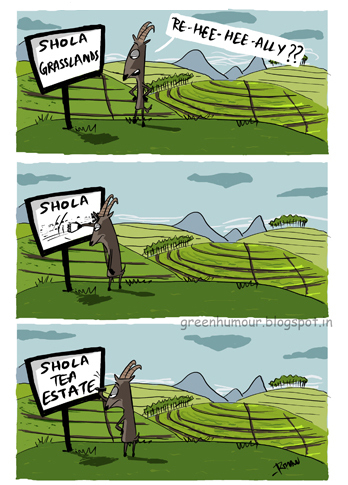 The home of the Nilgiri Tahr, the Shola grasslands are fast being replaced by tea estates. This member of the goat family is a precious Western Ghats endemic, listed as endangered by the IUCN with a current population of about 2000. The Nilgiri Tahr or the Nilgiri Ibex is an endemic of the Western Ghats. It has been discovered to be a closer relative of sheep rather than its namesake. Classified along with the Himalayn and the Arabian Tahrs earlier, the Nilgiri Tahr has now been accorded its own genus. The tahr is fast losing its habitat to tea and spice plantations across its range. Eravikulam National Park in Kerala has the highest density and largest surviving population of Nilgiri tahr. First published in Saevus in the May-June 2013 issue.